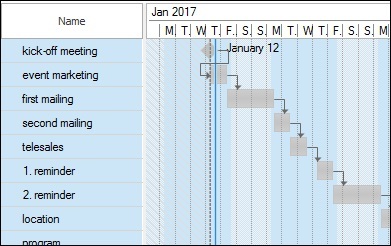 The following steps guide you through creating a new project Gantt-Chart with InLoox. Open Outlook and click on the tab InLoox PM or InLoox now. Click in the ribbon on the Start tab and click on Projects. Create a new project or select an existing project. Click on the tab Start and in the ribbon on Planning. The InLoox project plan consists of the planning list on the left, where you see the two fields Info and Name when you first open the InLoox planning, and the Gantt-Chart in the calendar view on the right. Click on the tab Edit. Then click on New Activity or New Milestone to create one of these new planning elements. You can also use the short cuts Ctrl+N (or Cmd+N) for a new activity or Ctrl+M (or Cmd+M) for a new milestone. Click on the tab Edit, and then click on New Milestone or press Ctrl+M (or Cmd+M). You see the New Milestone in the planning list. Give it a new name, e.g. “Kick-off meeting”. Press ENTER to save. If you want to create a new activity, do the same, only click on New Activity in the ribbon or press Ctrl+N. Each planning element starts and ends at the same time. No dependencies have yet been established between the planning elements. As each planning element’s start date lies in the past, they are all highlighted in red and are marked as overdue by the symbol in the info column. If you combine several activities which are logically connected and need to be finished within the same time frame, you create a summary activity. 1. Create all those activities, that you want to combine, e.g. all marketing activities. 2. Mark each of the activities by pressing Ctrl and clicking on each planning element. In this example, “event marketing” is supposed to become the summary activity. 3. Then click in the ribbon on Edit and click on the right arrow in the section Arrange. The individual activities are now indented. 4. 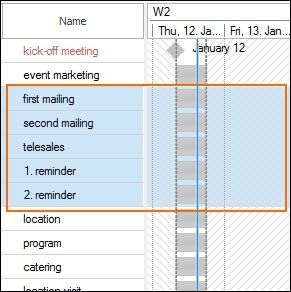 The summary activity “event marketing“ is visualized in the Gantt-chart as a summary bar. If you click on the arrow next to the summary event’s name you can collapse the subordinate activities. 5. If you want to undo the creation of a summary activity, simply click on the undo icon in the upper left hand corner or mark all the subordinate activities of the summary activity and click on the left arrow in the ribbon in the section Arrange. ATTENTION The duration of the summary activity is calculated based on the start and end dates of the subordinate activities. I.e. that a summary activity starts on the start date of the earliest subordinate activity and ends on the end date of the latest subordinate activity. If you change the start and/or end dates of the subordinate activities, the duration of the summary activity is automatically adjusted. 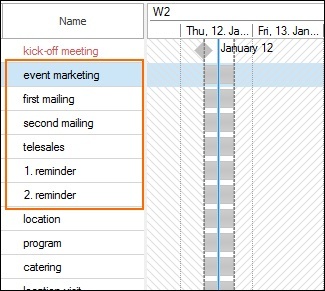 If you want to delete a planning element that you have just created, simply click on the undo symbol in the upper left-hand corner of the Outlook toolbar. Otherwise, mark one or more planning elements you want to delete and click Delete in the tab Edit. InLoox will ask you again, if you a sure you want to delete the planning element. Confirm by clicking Yes. ATTENTION If you delete a summary activity, all subordinate activities are deleted as well. If you only want to undo the summary activity, learn here how to do that. 1. Click on the planning element that you want to move. 2. 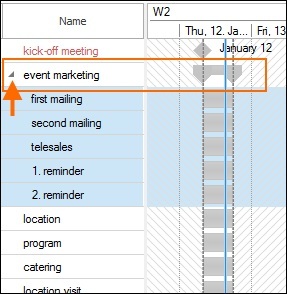 Open the tab Edit and use the arrows in the section Arrange to move the planning element up or down the list. 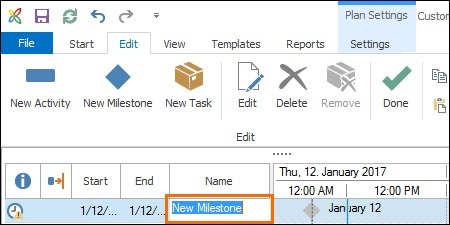 If you want to convert an existing activity into a milestone or vice versa, you do not have to delete it and create a new one. Click on the planning element, you want to convert and then open the tab Edit and click on Convert in the section Action. ATTENTION Summary activities cannot be converted. If you have created the planning elements in a chronological order, you can link them with just one click and create dependencies between the planning elements. That way, you create a project plan based on the waterfall model. 1. Click on the planning elements you want to link. Use Ctrl+A to mark every planning element in your plan. 2. Open the tab Edit and click on Link Automatically in the ribbon in the section Action. 3. The marked planning elements are now linked. Proceed to edit the dependencies. 4. If you want to undo the automatically created dependencies, mark the planning elements whose link you want to undo and click on Remove Dependency in the tab Edit in the section Action. Or click on the undo symbol in the Outlook tool bar in the upper left-hand corner. You can highlight planning elements by assigning them a flag or color. Click on the planning element you want to highlight, open the tab Edit and click on Flag or Color in the section Highlight. 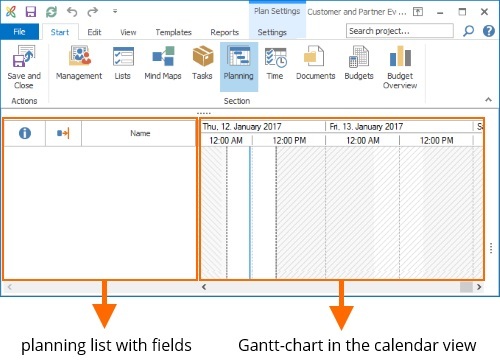 TIPP In order to see flagged planning elements, display the field Flag in the planning list. Learn here how to display fields. 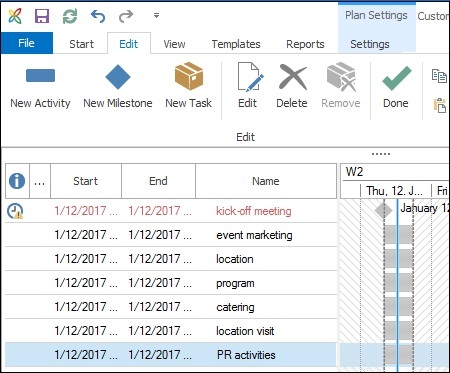 Create, edit, and delete new planning elements – activities and milestones | InLoox 9 for Outlook • Copyright 1999-2019 © InLoox, Inc. All rights reserved.